The English Cocker Spaniel belongs to the Retrievers - Flushing Dogs - Water Dogs in the FCI grouping. The English Cocker Spaniel is classified under the Sporting group in the AKC grouping. Is the English Cocker Spaniel allowed as a pet in a Singapore HDB flat? England, 1800s. One of the oldest spaniels known. 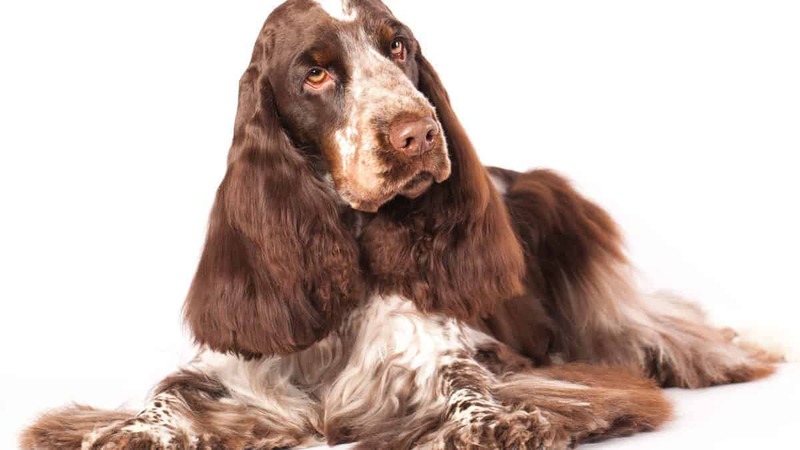 Originally imported to England as a general spaniel-type dog, they were subsequently divided into 7 different spaniel breeds: The Cocker Spaniel, Clumber, English Springer, Field, Irish Water, Sussex and the Welsh Springer. The Cocker and Springer Spaniels developed together, with only size differentiating them until 1892, when the Kennel Club of England recognised them as separate breeds. In 1946 the American and English Cocker Spaniel were made distinct when the American and Canadian Kennel Clubs separated the breed. The name "Cocker" comes from the woodcock, a game bird the dogs were known for flushing. The Cocker Spaniel is a hunting-gun dog able to work in challenging terrain in both wet and dry land. Cocker Spaniels excel at flushing and retrieving game with a gentle mouth. Obedient, exuberant, cheerful, joyful, gentle, loving. Elegant. Bigger and more houndlike than the American Cocker Spaniel. Makes a good watchdog. Very family oriented and enjoy traveling. Needs plenty of human companionship and doesn’t do well if left alone for long periods. English Cocker Spaniels calm down as they mature. Average barkers. 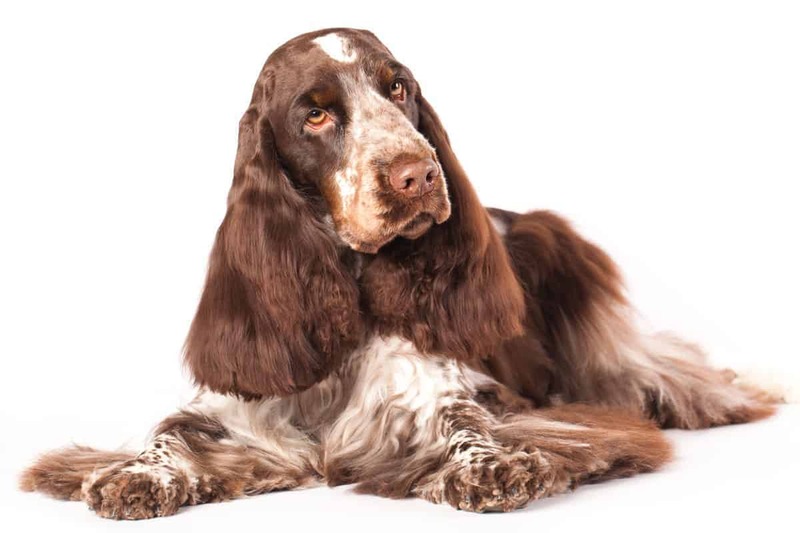 What are some Physical Features of the English Cocker Spaniel? 38 to 43 cm; 12 to 16 kg. Colours are solid black, red (gold), liver, black-and-tan, buff, liver-and-tan; any of the foregoing on a white background, either parti-colored, ticked, or roan. Silky, flat, or wavy. High maintenance, though he has less coat than the American Cocker Spaniel. Some coats with an excess amount of cottony hair and are more prone to matting. Unless carefully groomed, this dog looks messy. Ears and feet need special care. Professional grooming is recommended; some trimming required. Average shedding year round. Eye problems (PRA, cataracts, glaucoma, distichiasis), hip dysplasia, prone to ear infections (check often), cardiomyopathy, obesity, deafness (parti-colours). Some solid colours have a history of rage syndrome. High; they need a lot of exercise, much more than the American Cocker. Field lines require have a higher energy level and require even more exercise. Can adapt to any living situation. Does okay in apartment life if sufficiently exercised. An average sized yard preferred. Excellent, English Cocker Spaniels are very good with children, and generally take on strangers well. Some under-socialised individuals can become reserved with strangers. Gets along with most other pets, as long as they are introduced properly. High. Picks up commands fast.